Text of article as it appeared in American Artist magazine in the August 1988 issue. 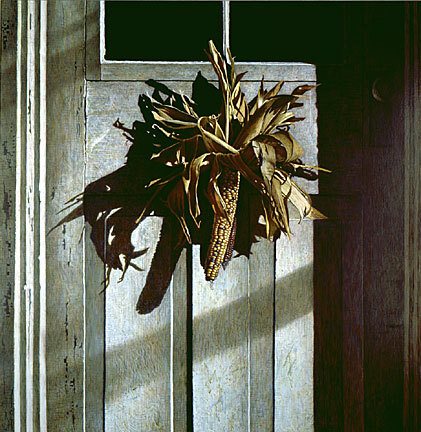 This award-winning Pennsylvania artist uses traditional egg tempera painting techniques to depict the effects of sunlight on his collection of weathered, man-made objects. Douglas Wiltraut lives with his wife, Beth, and their two children in northeastern Pennsylvania, a few hours north of the Brandywine River Valley, in an eighteenth-century house once owned by his grandparents. He is working to restore the aging, two-story structure, believed to have been a tavern on the route west, to its original simple and gracious beauty by repairing plaster walls, refinishing the wooden floors, and installing a wood-burning stove. Old pitchers, jugs, baskets, buckets, trunks, irons, and chairs collected at auctions and trade shows and from family members are Wiltrauts subjectseach caught for a moment in streaming, bright sunlight. It is only fitting that Wiltraut has also discovered that the traditional Renaissance technique of egg tempera painting is perfectly suited to capturing his light-bathed subjects. I try to capture a particular feeling in my paintings, a sense of the temperature of light, Wiltraut says. I like to think that if I could place my hand into a shaft of light in my painting, I would be able to feel the warmth of the sun. In some works, Wiltraut has painted the hot afternoon sun; more often, he chooses to work with the complex subtleties of rapidly fading evening light. It is this light, he says, that creates special visual momentswhen a momentary sliver of sunlight may transform a seemingly ordinary object from the commonplace into the unique." When painting a brightly lit object, Wiltraut concentrates on two major factors in order to successfully create his effects. First, he presses the contrast of values between the light and dark areas within the painting almost to the point of exaggeration in order to make the sun come out. This contrast between the light and dark areas shapes Wiltrauts paintings. Second, he has found through experience that it is very important to work on the often overlooked details within the shadows. Wiltraut says that it is being able to peer into shadows and see what is there that adds to the realistic effect. Since his overall compositions are designed in his head, Wiltraut does few preliminary drawings. One school of thought believes that you cant have too many drawings, but I dont do very many, explains Wiltraut. I guess, for me, its boring; I want to get right to work on the paintingthats where a lot of my drawing happens. He does do some tight pencil renderings to work out small details of the composition. He never uses charcoal or Conte crayon. For several years, Wiltraut worked on developing a stipple technique, painting like some Impressionists by using tiny dots of color to create the larger forms and shapes. He continues to use this technique on skin in his portraits to give it a lifelike quality, but he rarely uses this method on anything else. Instead, he has adapted many of the color techniques he learned when stippling to his other methods for laying in color. Wiltraut usually applies his paint using tiny strokes, creating a layered, crosshatched surface, and every inch of that surface is filled with color. One of the principal color methods Whiteout has adapted is the creating of optical mixes by using any two complementary colors, such as orange and blue, to create a third, neutral tone, in this case brown. When closely observed, the different touches of color are separate. When seen from a few feet away, the colors melt together, creating a subtle vibration and sense of movement difficult to trace to its cause. The darker shadow areas in Wiltrauts paintings most fully display this color technique. Wiltraut explains another color method: Even though I am not painting landscapes, with their deep spatial distances, I use the color changes of atmospheric perspectivecooler colors in the distance, warmer tones near the foregroundin both my still lifes and portraits. It is as if I had inserted a color thermometer perpendicularly into the plane of the painting, keeping the warm colors closer and the cool colors further back. Even when there is a very narrow depth of field, these color changes can work for you to help create the illusion of three dimensions. By the time he began high school, Wiltraut had studied every book on painting he could find and had taught himself how to depict realistically the world around him. His teachers let him turn most of his classes into art projects and he kept reading and working to find the ideal way to represent nature and light in realistic paintings. Since he was born on the same day and month as naturalist writer Henry David Thoreau and painter Andrew Wyeth, some would say that Wiltraut was fated to make this search. Wiltraut began getting recognition for his extraordinary artwork early in his career. In 1973, he became the youngest artist ever selected for Todays Art magazines Medal of Merit in the 21st Annual National Society of Painters in Casein & Acrylic Exhibition. Now, in recognition of his many awards, medals, and other honors over the past fifteen years, he has become an elected member of the Audubon Artists, Allied Artists of America, and the National Society of Painters in Casein & Acrylic, serving in the last as director, vice president, and exhibition chairman. Often, Wiltraut is asked to jury regional and national exhibitions. he was awarded the Ralph Fabri Medal of Merit for an unprecedented second time in the 1988 Allied Artists of America Annual. Wiltraut builds all of his own panels using 1/4 untempered Masonite glued into a framework of 1 1/8 x 1 1/8 baluster molding with carpenters wood glue (1). He holds the glued framework and Masonite together with C-clampsthe pressure is redistributed by small strips of wood slipped between the Masonite and the clamp itselfand leaves it overnight to dry (2). He then rounds off the corners of the Masonite to prevent damage to the gesso and paint layers during framing, shipping, and handling, and roughens the painting side, or front, with sandpaper to provide better tooth for subsequent layers of sizing, gesso, and paint (3). In a widemouthed jar, Wiltraut mixes the granular flakes of rabbitskin glue (also available in sheets) with water, 1 oz. of glue for every 16 oz. of water (4, 5). The covered mixture then stands for at least two hours so the glue particles will begin to dissolve. The softened mixture is heated in a double boiler until it is completely liquid and is applied to the panel while still warm. Wiltraut applies two coats of rabbitskin glue sizing to each side of the panel. The first coat should be straked, or, as Wiltraut explains, a brushful of glue should be applied in a row of parallel strokes. Then, before putting more glue on the brush, stroke over that same patch in the opposite direction. The first layer should be allowed to dry for twenty-four hours before the second is applied. One more day should pass before gessoing (6). 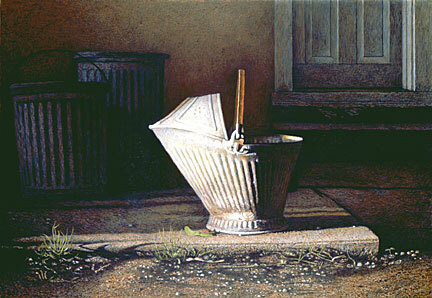 Wiltraut uses a Fredrix preprepared powdered gesso mixed in a two-to-one ratio with water. Then, in a similar procedure to his preparation of the sizing, he places the mixture in an open, wide-mouthed jar and melts it in a double boiler (7). The gesso is applied to the panel while it is still hot to ensure the best absorption and bonding with the wood. Six coats of gesso are applied to the back of the panel and five coats to the front. The paint will be adding another layer to the front, ensuring a balance. He warns that the panel will warp away from the side gessoed first for a few days (8). Again, as with the glue, the first layer should be straked to minimize the formation of bubbles on the surface (9). The coats should be applied thinly and, Wiltraut says each coat should follow the last as soon as the sheen of dampness from the previous coat disappears. It is important that all of the layers dry together as on unit. The panel then sets for two days before the surface is smoothed. Wiltraut does not use sandpaper for smoothing the surface, but has instead prepared a 1 x 3 flat wooden block. He dips the block into a bowl of water and rubs the surface with a circular motion until the block begins to pull or stick. The block is again dipped into the water and the process continues until the whole surface is smooth (10, 11). The surface is then wiped lightly with a damp paper towel and dried overnight. The panel is now ready for painting. Only the yolk of the egg is used in egg tempera painting. Wiltraut carefully separate the yolk from the white, punctures the yolk sac, and drains the yolk into a small bowl (1,2,3). He mixes the yolk with distilled or filtered water to form a half-and-half mixture. Wiltraut recommends using distilled water here and in the earlier procedures in order to avoid the unknown impurities in tap water such as mineral deposits and discoloration from unforeseen chemical reactions, which can possibly cause problems later (4). Unlike many egg tempera painters who mix water with their pigments and store them in jars, Wiltraut prefers to dump out small piles of pure, dry color directly onto his palette (5). Wiltraut warns that some pigments, such as Thalo blue and alizarin crimson, have a grainy, hard texture and will remain in suspension as dry lumps of color on the painting surface if they do not receive additional moistening and grinding before use. He likens them to the dry lumps of powdered chocolate that will remain in a glass of Nestles Quik. Two pigments, burnt umber and cobalt blue, require more egg in the mixture to ensure that they dry to the same smooth, waxy sheen as the other hues. Indian Headdress, 1988, egg tempera, 30 x 30. Collection Mr. and Mrs. Myron Haydt. Ten photos of preparation of the egg tempera panel. 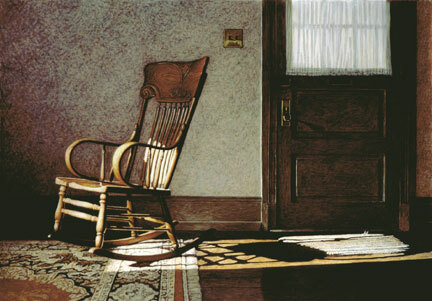 Boston Rocker, 1983, egg tempera, 20 x 28. Collection Dr. and Mrs. Bruce Viechnicki. Six photos of preparation of the egg tempera paint. 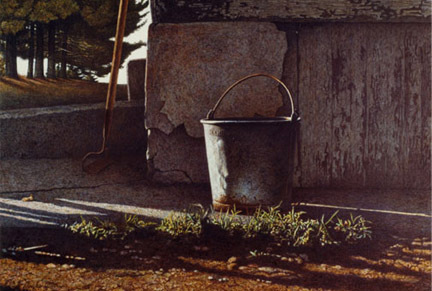 Out Back, 1985, egg tempera, 24 x 34. Courtesy Mr. and Mrs. Thomas Khoury. A detail of Out Back. Seven photos of the application of egg tempera paint. Friendship Ring, 1987, egg tempera, 24 x 34. Courtesy Mr. and Mrs. Thomas Khoury. Dying Embers, 1987, egg tempera, 24 x 34. Collection Mr. and Mrs. Myron Haydt. Valerie R. Rivers is an assistant editor of American Artist.